At the start of Donja R. Love’s effortful drama Fireflies, a woman walks onto a porch, gazes up at the sky, smokes a cigarette and writes a letter. And here, in just the first few seconds, is the trouble at the heart of the play: Because of bad dramatic planning, a character has been given too much to handle. Poor Olivia (DeWanda Wise) has only two hands, but she tries to gesture with paper, pencil and cigarette simultaneously. The porch’s newel post then makes an awkward writing surface, so she gives up and starts dictating her letter to the air—which introduces the show’s second telling flaw. Love may have a lot to say about black queer resilience and God’s bounty, but he hasn’t worked out how to deliver information gracefully. Olivia writes all her letters out loud. Her longtime husband Charles (Khris Davis) says nakedly expository things like, “I got you ice cream…strawberry….your favorite…like I use to when we’d go on our walks back in college.” It’s like a marriage of amnesiacs. One minute they’re passionately hurling themselves into each other’s arms; the next they have to remind each other that they are having intimacy issues. Do they not remember? Don’t they live together? Olivia’s porch letter is to a mysterious woman, and eventually we learn that she has a whole stack of such letters under her bedroom floorboards, unsent and steaming with unspoken passion. In her professional life too, Olivia is a wordsmith, writing sermons for Charles, who is a star in the Civil Rights movement. 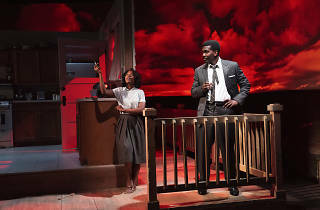 Most of the play takes place in their Alabama kitchen, where the couple has three encounters. In each of them, secrets geyser out of the ground, then subside, then whoosh up again. Both characters are stuffed with qualities that only emerge when they’re mentioned, sometimes in direct contrast to what we’ve seen of the person so far. Charles is a drunk, an orator, a possible wife-beater, an ex-stutterer, a misogynist, a lover of women, a wannabe father, a philanderer, a hero. Olivia is outspoken, closeted, pregnant, ambivalent about her pregnancy, secretive, possibly insane, attuned to antiblack violence so much she hears explosions in her head, a shut-in, a goddess. It’s not the actors’ fault that they’re unable to make coherent characters out of this chaos of impulses and characteristics; it’s impressive, therefore, whenever they make an isolated speech ring with confidence. This happens in fits and starts. Love’s writing overflows with imagery, which does sometimes contain a kind of maximalist power: Olivia's sermon about fireflies, for instance, which is inspired by a dream she has had about God beckoning his chosen people home. 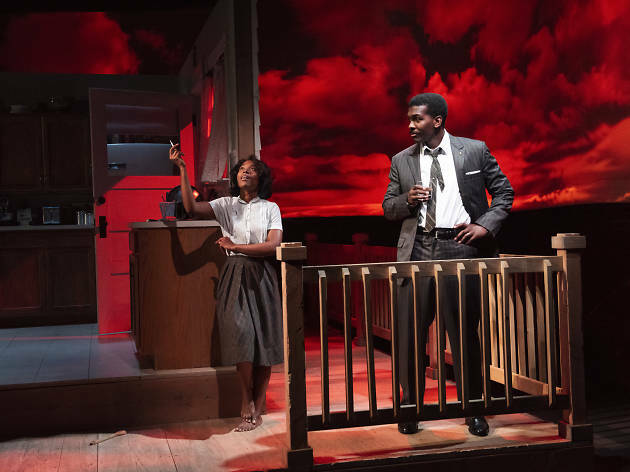 Arnulfo Maldonado’s set and David Weiner’s lighting do a nice job of making the kitchen look like a free-floating island, which serves Love’s dream-logic structures as well as a set can. But they and the rest of director Saheem Ali’s team are undercut by Love’s inorganic changes in tone and motivation. The play's moments of light wink out well before the final curtain; in Love’s universe, fireflies don’t shine for long. Atlantic Theater Company (Off Broadway). By Donja R. Love. Directed by Saheem Ali. With Khris Davis, DeWanda Wise. 1hr 30mins. No intermission.